If you’ve ever wanted to start your own jewelry business, now’s the time. It’s more affordable than ever to produce your jewelry collection, and resources abound for new aspiring jewelry designers to get started. Although this article will focus mainly on fine jewelry, most of the steps here can apply to fashion or demi-fine jewelry as well. If you’re not looking to create a brand but want to start a jewelry retail store instead, see our article on the subject here. 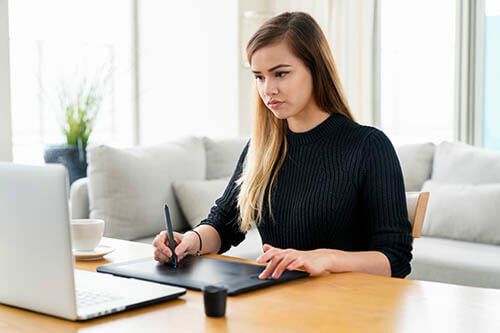 Before you get started, it’s important to note that you don’t even necessarily need any drawing, design, or production skills to become a fine jewelry designer, although it would definitely help. For a quick overview of how to become a jewelry designer without any prior experience, check out our blog on the subject here. Then, come back here for a more in-depth outline of how to start your brand. Every business is different, so the exact path you take in establishing your jewelry brand may vary. That being said, you can use this step-by-step list as a handy guide during your journey. And if you have any questions, don’t hesitate to send us a message. We’ve been helping fine jewelry designers produce their collections for years, so we know a thing or two about the process! Before you begin actually producing your jewelry, you’ll need to have a business idea. The truth is, since crafting fine jewelry is more affordable these days, a lot of budding jewelry designers are getting their start in the business. This is great, but it means a lot of competition. In order to stand out from the crowd, you’ll need to have a truly unique design aesthetic. If you have an art and design background, this will make things a little easier. If you don’t have an art or jewelry background, don’t worry! You can always hire an artist or designer to execute your ideas, or partner with a jewelry design studio to create your first drawings. To get started, begin browsing through Pinterest or the jewelry collections of your favorite designers, and take note of what styles and trends you’re drawn to. Although your jewelry needs to be unique, you don’t need to reinvent the wheel. Gather inspiration from the jewelry you love and learn from these designs to create your own. Even if you don’t use it on your search for inspiration, Pinterest is a great place to gather all of your images in one place for reference. Write down all of your ideas for new jewelry collections. Perhaps you’re inspired by a particular geometric shape, a visual theme, or a type of gemstone. At this stage, it can also be useful to do some market research. Look into how other similar jewelry brands started, what consumers are buying, and what kind of stores your favorite brands are featured in. One way of making your jewelry collection stand out is to have a particular brand story or theme. Although your overall branding story may change later in your journey, it’s still good to have general idea ahead of time. For instance, Alison Lou’s collection is all about fun and chic designs for women by women, inspired by emojis and other elements of modern culture. On the other hand, AUrate is a growing minimalist jewelry brand with a focus on sustainability and ethical sourcing. Both of these brands launched in the past decade, and their current success all started with a simple and unique business idea. The next step is to draw some early versions of your jewelry designs. Even if you lack drawing skills, do your best to make a few quick sketches for how you envision your pieces. If you have an art background and feel comfortable drawing jewelry, put as much detail as you can into each sketch. You’ll be using these drawings in order to convey your brand vision to potential partners and collaborators. Besides, you’ll want to have a good idea of how the jewelry will look before you create the 3d design or handcraft the piece. Whenever possible, take note of measurements and specs for your jewelry. This includes writing which gemstones you plan to incorporate and their carat weight, as well as the metal type and any important technical characteristics of your piece. Again, if you aren’t sure about any of this, all you need to do at first is write down some ideas or draw some basic designs. 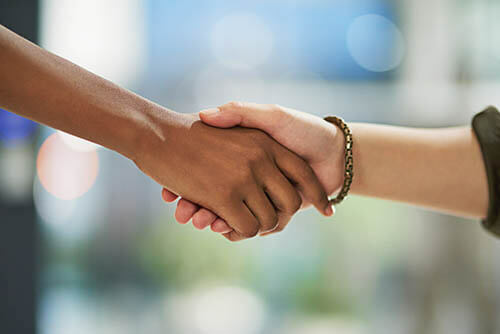 While this step doesn’t necessarily need to take place at this stage, you still want to try to find a business partner as soon as you can. If you’re a designer, you’re going to need someone with business, management and coordination skills. If you’re a business visionary, you’re going to need a designer. While there’s a chance you might find someone who excels with both of these skill-sets, it’s pretty rare. Either way, it will be extremely challenging and time consuming to juggle both aspects, so it’s always a good idea to find your other half in business. For some inspiration from a successful designer/businessperson duo, check out the popular brand Walters Faith. It’s important to have a business partner early on to avoid getting too overwhelmed. 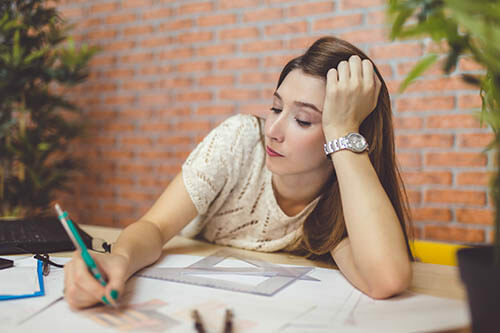 Although starting a jewelry business can be slow, things pick up quickly and you can easily find yourself with too many tasks and not enough time. Still, you can always wait until your first models are produced before forming a partnership. For the few who possess both strong business and creative skills, you can manage the entire business on your own starting out, but you’ll likely need a lot of time. As your business grows, you’ll definitely need to hire assistants and other talented people to help you. Unless you plan on crafting all of the jewelry yourself, you’re going to need to work with a jewelry manufacturer at some point. While it might seem like you need a ton of money to even get started with your collection, in truth producing your first pieces of jewelry is surprisingly affordable. This is not the same amount of investment as say, opening a restaurant would cost. Essentially, when you’re starting out as a jewelry designer, all you really need is to produce one sample collection. As you start making your first sales, you can have everything made to order. Once you have a steady stream of sales, then you can invest in manufacturing inventory, but it’s definitely not necessary to produce hundreds of pieces of jewelry before your business is established. The pricing of jewelry manufacturing can be a little complex. The jewelry studio you work with will be able to break down your costs, but it’s important to understand where your budget is going in the creation of each piece. When a jewelry studio produces your piece, they’re carrying out a few different tasks: creating the 3d design, calculating the weight, printing a model, buying the gems, and finally the actual labor of handcrafting the piece. All of these tasks vary widely depending on the complexity of the design and the price of the materials, but in general you can expect to pay as little as $3000 for a simple ten piece collection. Of course, if your jewelry has a lot of diamonds, is really thick, or requires highly detailed 3d rendering, the price will rise. Compare this to the average cost of starting a restaurant ($275,000) brewery ($100,000) or a gym ($50,000). Even if your budget is lower than $3000, you can always start out with just having one or two pieces made. 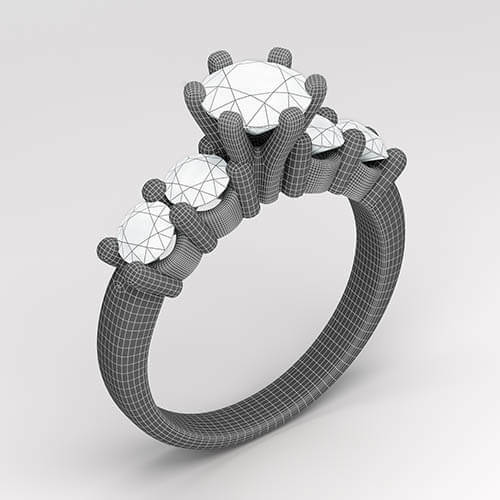 Once you’ve set aside a small budget to produce your first collection, it’s time to meet with a 3d jewelry designer. You can choose to work with a freelance CAD designer, but it’s usually better to partner with a designer at an established jewelry studio. That way, you can be sure the designer you’re working with has hands-on jewelry knowledge and won’t make any crucial design errors. If you work with a freelance artist who doesn’t understand jewelry manufacturing, you might end up with a 3d design that isn’t functional and that your jeweler can’t work with. In your first meeting with a 3d designer, bring any notes, sketches or reference images along with you. If you’re working with a competent designer, they’ll be able to then transform your vision accurately into a 3d model. Of course, you can request revisions until the design is developed to your liking. If you want to learn more about CAD models and what it’s like to work with a 3D designer, read our blog here. Once you approve the 3d design, the jewelry studio will then go ahead and begin the manufacturing process. First, they’ll print a wax model made out of resin using a 3d printer. You can take a look at the wax and have a final opportunity to make any other changes to the digital model before the team begins handcrafting the piece. If you like the wax model, your jeweler will have it cast into gold, platinum or silver, and then set the diamonds and other precious gems into the final piece. After only a week or so of production, your first jewelry collection will be ready for sale! 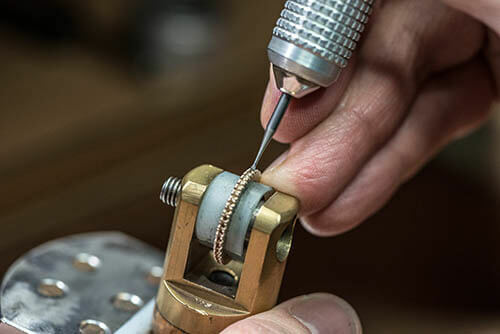 If you’re confused about how the jewelry manufacturing process works, be sure to check out our blog that breaks down the whole process. Many millennial-powered and recent jewelry brands that have started in the past ten years have adopted an e-commerce, straight to consumer business model. In the past, it was usually necessary for new jewelry designers to sell their jewelry through a retail store before they could sell jewelry at their own branded shop. Today, it’s easier than ever for jewelry designers to sell directly to their fans, and make a lot more profit in the process. Thanks to the internet, new designers can open an online store and market their jewelry for much less than it would cost to open a traditional brick and mortar store. If you’re planning on launching your business soon, it would be wise to open up some essential social media accounts like Facebook and Instagram, as well as set up your website on an e-commerce platform like Shopify or Squarespace. For info on building your social media accounts for your jewelry business, read our blog here. If you need a quick overview of opening an online e-commerce store, see our article on the topic here. At some point as your business starts to take off, you’ll need to add additional members to your team. This doesn’t necessarily need to be full-time employees of your business, but if you’re starting to make sales online and need to manage inventory elsewhere, you and your business partner will need some help. In terms of marketing and web design, you can always outsource this work to freelancers. For social media management, interns are a great choice to help build your brand’s presence during its earlier stages. In terms of inventory management and other business related tasks, you might need to hire at least a part-time assistant at this stage. As your business expands, you can work out of a co-working space and later start renting office space. As your first sales start coming in, you can start to evaluate what your customers gravitate towards and adjust your collection accordingly. When you’re ready to start designing new pieces, draft up some sketches and work with your chosen design studio to start growing your product list. While a custom design studio is a great choice to manufacture your initial collections, you may want to transition to working with a larger manufacturing house to produce bulk inventory. Still, it’s good to maintain a relationship with your original design studio and continue work on your 3d CAD models. Since they helped to develop your designs from the start, they know your brand and design aesthetic inside and out, which can be a useful asset as you build your business. At this point, you’ve went through quite a journey: developed your first pieces of jewelry, started your online store, and brought in your first sales. As awareness of your brand has grown, it’s a good idea to start bringing your jewelry into retail stores, boutique shops and online marketplaces. You’ll need to develop a lookbook, line sheets and any other materials that will help potential buyers evaluate your jewelry and see if its a good fit for their store. Again, it’s important to note that these steps might not happen in the same order for everyone. 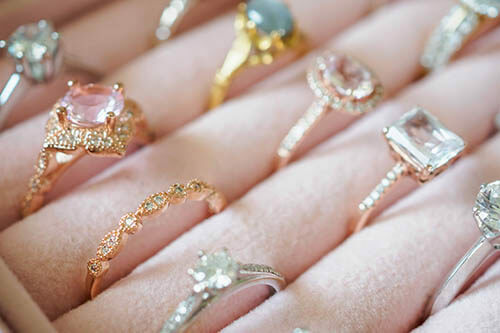 For some jewelry designers with the right connections, they might get their collection into an online marketplace before making online sales on their own e-commerce store. If you have the budget, it’s a good idea to start investing in some PR. You don’t need to have the top stars wearing your jewelry, especially in the beginning, but it’s definitely helpful from a business and marketing standpoint if micro-influencers, magazines and others are getting the word out about your brand. Once your company is fully established, which means your brand name and jewelry has a strong online presence, you have an efficient production team in place, and your jewelry is featured in a good number of stores and online platforms, then you can start to consider expanding into the international market and investing more money into working with top influencers and celebrities. If you think it makes sense for your business, you can also open up your own boutique store featuring your collection. Given the right planning, management, and marketing, your business can grow relatively quickly. 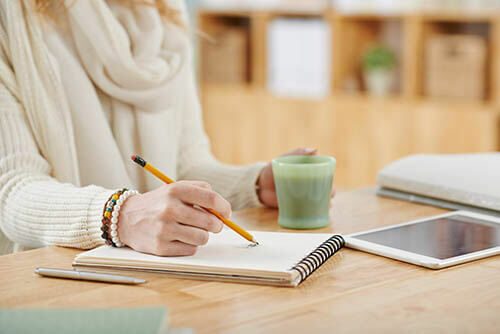 If you’re just starting out, spend a little time brainstorming your ideas and determining what you want your fine jewelry business to look like. When you’re ready to start creating some preliminary drawings or 3d designs, feel free to stop by our studio or schedule a video call and we can walk you through the process. If you just want to learn more info on the fine jewelry industry in general, explore our blog to read the latest trends and interviews from top designers.